I like a good moist coconut cake… not “love,” but do enjoy on occasion. As is the case all around, there have been some ladies in my community, who, over the years, made a name for themselves with their cakes. I’ll start this tale with a funny happening I had regarding “vintage” cakes that will take us full circle to this coconut cake saga. I was recipe developer and food stylist for years at Our State Magazine here in North Carolina. (Check out my work there here and here!) Before I came on board, they had been asking readers to send in their favorite church and community cookbooks for consideration in the new section they were creating in the magazine where these books would be featured. By happenstance, I judged at the NC State Fair that October as I do each year, but one day the Our State editor, Elizabeth Hudson, happened to be judging too. We exchanged cards and she said, “well maybe we can use you at the magazine someday.” Well of course I was giddy at that idea but had little faith anything would come to be. But a couple of weeks after that, they got in touch and told me of this new section starting… in JANUARY! Now keep in mind, this was the end of October, and they, like all magazines, work months in advance of publication! They asked if I would like to prepare the foods for this new cookbook feature section each month…. Now keep in mind, I’d n.e.v.e.r. done any such thing, and had no idea nor training in the world of food styling!! But off on yet another culinary adventure I went. For the first few months, we did 10…. yes, TEN recipes each month! Folks, that is a LOT of food shopping, prepping and cook’n. To have to cart over to monthly shoots in Greensboro one day a month that we started at 9:00AM! A few months later, that was trimmed to 8, then 5, and by the time I left 5 years later, we were down to 3 a month! Much of that is dictated by ad sales and how many pages will be in each issue. So the first 4 years, the editor in charge of the recipes would select which book(s) would be featured (there were hundreds if not thousands of books on the shelf there at the OS office). Then, she would speak to the entity who did the book and find out any favorites in the book(s). The recipes chosen to be featured would be sent to me to shop, prep, prepare and prop! It wasn’t until 4 years later I got to create and feature my own recipes each month. Now most that know me know that I don’t particularly care to BAKE. The words “yeast” and “knead” send my brain into a tizzy! I didn’t let this on for a while at OS because I was so tickled and excited for this opportunity, I didn’t want to be negative about such. And they NEVER would turn out right! I’d make the recipe several times with failure each time. I’d call the editor in panic and despair, and she’d sometimes pick another last minute recipe for me to sub. 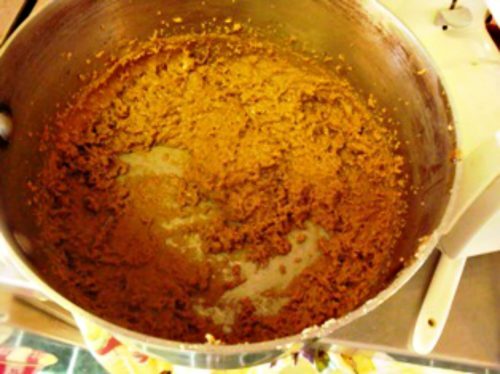 Well one month, sometime into the first year and after multiple cake “issues,” I was sent a caramel cake to make. I made that damn cake 3 times. It called for use of a candy thermometer (another tool causing me extreme stress)! Before I could lift the pot of sauce off the burner and turn around to spoon over the cake, that damn frosting turned to concrete, right there in the pot! The one recipe I did manage to get “poured” onto the cake wasn’t enough to ice a large cupcake! (see picture below). I actually found some pictures of this nightmare I shot that day to send the editor to show her what this recipe she sent me was doing… and asked… “WHAT DO YOU WANT ME TO DO?” Do excuse the horrible quality of them… they were shot quickly on an old phone to send to her to see what I was trying to describe and are as bad as the icing and cake themselves! I was crying. The shoot was the next morning. I was on try 4 of this monster! I was posting my angst on facebook! A baking friend saw my panic and called me… said to send her the recipe to make. She got the stuff together and made it. Well low and behold, it did the same thing for her too! She surmised, which made perfect sense…. that oftentimes, these ladies (Church Cake Ladies I call them) were known for “their” cake! Their particular cake was their claim to fame so to speak in their community! So when somebody in the church or community was putting together a fundraiser cookbook and asked them to contribute their recipe, they’d change it in some way, unbeknownst to the cookbook person, so nobody could actually successfully duplicate “their” cake! I’m certain that was the case with those old recipes I was sent. And in each case, the book contact was asked to get in touch, but the ladies had passed on. So self got in gear. So I googled there in the Food Lion and pieced together some information to share with you right here… for making a chocolate version of this coconut cake… or just because! I am only discussing Duncan Hines mixes here as that is my preferred… because it’s what my Ma Hocutt used, and what my mama used. Devil’s Food... this is DH’s “basic” chocolate cake. It offers what might be called a “medium chocolate” flavor. Butter Chocolate… this is like Devil’s Food, but the oil is replaced by butter (oh yes!) making it a richer (more “devilish?”) version. German Chocolate… a light German flavored chocolate. This cake is most likely frosted with a pecan and coconut frosting. My mama’s favorite candy bar was an Almond Joy. 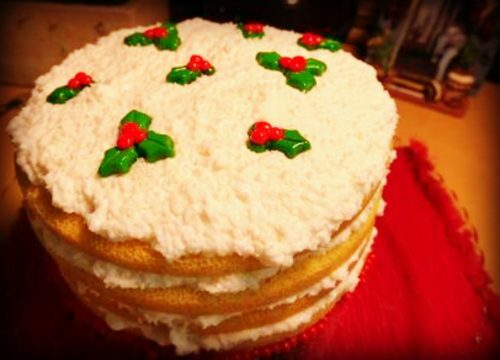 So sometime this Christmas season, in her memory, and because I’m curious, I’m going to make this old fashioned coconut cake. BUT… I got the Classic Dark Chocolate Fudge mix for my layers… and some almonds I’m going to toast and put on top! So stay tuned. When I get around to Part 2 of this cake tale, you won’t want miss out on MY version! Till then, if you make this cake, come over to my facebook community and share your experience… review, and pictures too! Hopefully it will look a whole lot better than this thing! 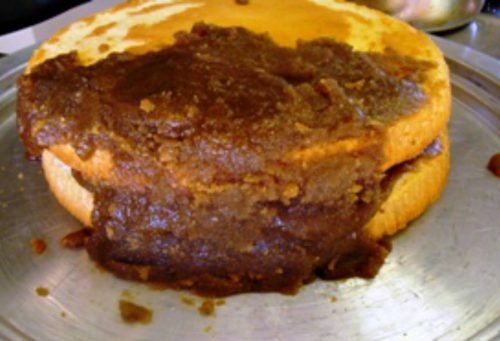 The caramel cake from hell!